By now, we’re all pretty familiar with the concept of the “hybrid”. The idea is to forge a marriage between two different entities with the aim of creating a synergetic new product that, as a sum, is greater than its parts. We’ve tried it with plants, cars, and, some would argue, we’re constantly trying it with people. Though it is certainly not the first to do so, Australia-based headphone maker, Audiofly, has applied the hybrid approach to its AF78 in-ear earphones and gotten a lot of attention for it. The AF78 combines a balanced armature and a dynamic driver into a single earbud. The goal is to match the supreme clarity of a balanced armature at the top end, with a warm, easily-tuned dynamic driver in the bass and midrange — a little warmth down low, and a lot of sparkle up top. 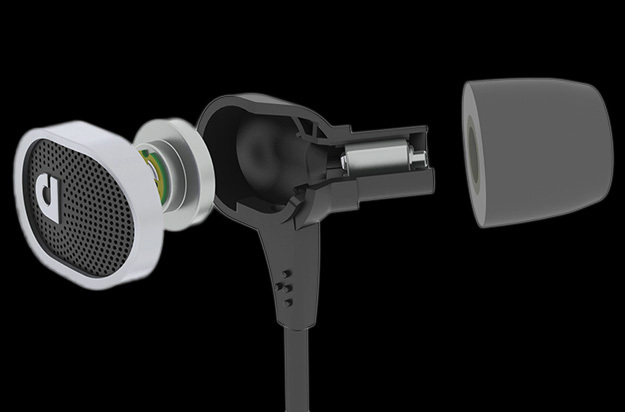 For its efforts, Audiofly was awarded a 2013 CES Innovation Award. That’s where we come in. We got a chance to check out Audiofly’s product line at CES this year, and though the company is barely an infant in the world of audio, we found it has already jumped into the deep end of the headphone pool. One of Audiofly’s more striking designs includes a new in-ear monitor that sports three – count ‘em – three balanced armatures. Yet, we ended up spending most of our time with the recently awarded AF78. During that rushed audition, we were impressed with the earphones’ superb clarity paired with visceral warmth. Now we’re back for a much closer listen. Will the AF78’s odd couple work in harmony, or will the drivers’ differences get the better of them? Read on to find out. First impressions are important, and it would seem Audiofly has taken that notion to heart with the AF78’s packaging. Pulling away a plastic exterior layer revealed a sumptuous brown box with all the tactile qualities of a quality-bound book, monogrammed with the Audiofly logo in silver lettering. Removing the magnetically bonded cover exposed the headset, sunken in thick foam padding, with a silver disc-shaped carrying case directly below it. Beneath the layer of black foam we found an adequate selection of accessories, including 5 sets of ear tips, a cleaning brush, an airline adaptor, and a splitter. The AF78 has the look and feel of a quality headset. 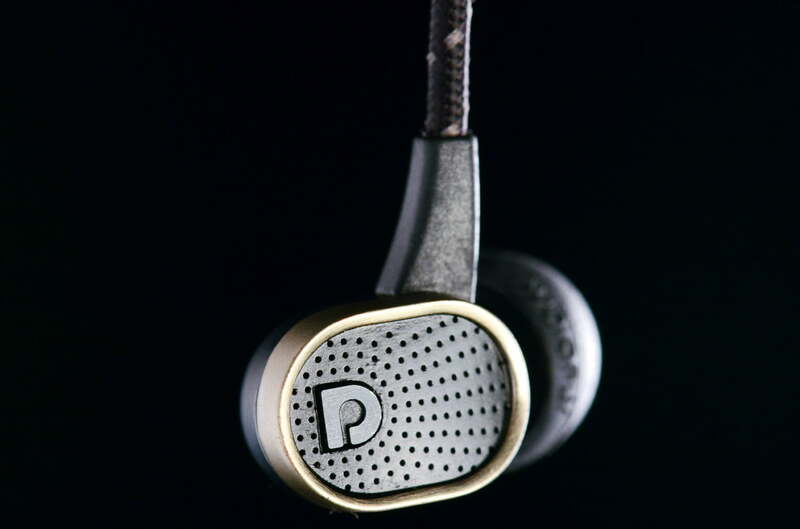 Each earpiece is crafted into a capsule of black plastic, encircled by a silver ribbon of anodized alloy. The face of each bud is capped with a flat layer of slightly beveled, vented plastic, crowned with a metallic “a” at the far side. The interior is rounded to fit in the ear, and stenciled with a silver stereo channel indicator. The shape successfully fills the ear canal to create better noise isolation. The Audiofly website claims the design lowers exterior sound by 23 decibels, and we found the buds did an ample job of deadening the noise around us. 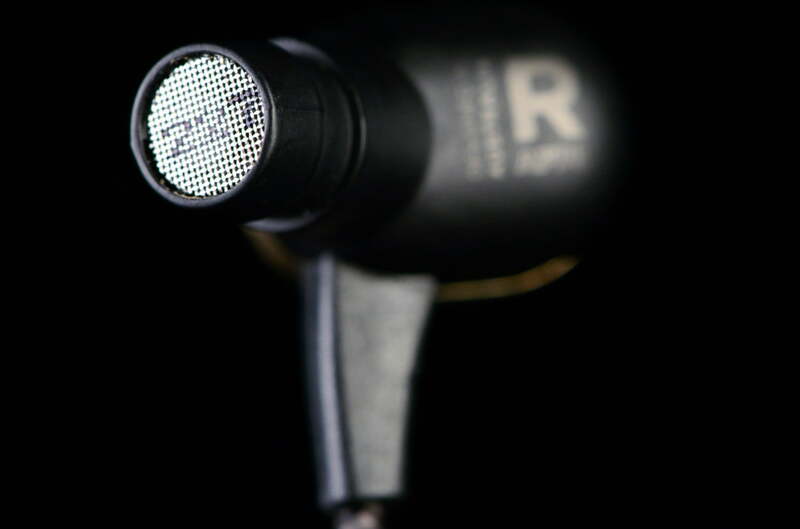 The cylindrical driver housings, which hold the balanced armatures and 9mm dynamic drivers, extends from the earpiece at a 45 degree angle and ships pre-fitted with a tightly-fitted Comply foam ear tip. The housing is pretty wide for an earbud, perhaps to accommodate the dual driver design. The AF78 sport a cloth-lined cable which splits into a ‘Y’ about 12-inches below each ear piece. The sample we received did not include an in-line microphone, though a version equipped with one is available for about $10 more. With regard to fit, we found the AF78’s felt a bit bulky in our ears. As such it was hard for some of us to get them to stay in place. Others of us were able to manage a secure fit. We ended up using the Comply tips as opposed to the smaller silicone tips because they were the most comfortable, but they also had a tendency to fall out over time. It’s important to note that the Comply tip tended to color the sound more than the silicone tips. We found the tone slightly darker in the low end with the Comply, which was actually a benefit to the sound for us. These issues of fit and ear tip type present a good opportunity to revisit the implications that fit will have on perceived sound quality. Since human ears and in-ear headphones are all shaped differently and to widely varying degrees, there will be times when a given in-ear suits one listener well, but does not for another. We found that to be the case with the AF78, which were sometimes problematic for this reviewer, but much less so for our audio editor. As such, our opinions on the AF78’s sound quality varied to a small degree. With that said, the general consensus among all who listened to these earphones were that they were quite good. With that in mind, let’s dig in a bit deeper. …It’s been awhile since we’ve been treated to so many stellar moments by a single pair of in-ears. We tested the AF78 through our iPhone 5 as it played back a diverse selection of music styles and genres. After an initial listen, we gave the headset about 40 hours of break-in time, which we found opened the drivers up quite a bit. We soon discovered the AF78 produce a complex sound signature, notable for its extreme accuracy, crystalline upper register and warm, defined low end. One of the AF78’s most prominent sonic attributes is its immaculate instrumental separation. The earphones flesh out the deep timbres in each instrument present in a given track. One of our favorite examples of this came during Bob Marley’s “Is This Love”, which had us chasing the different facets of the intricate production across a wide stereo image. Plunky percussion hits clicked with a tight ring on the edges of the stereo field, surrounded by glistening waves of echoed B3, smooth brass, and breathy vocals – all rendered with an almost tangible closeness. As we listened on, the AF78’s purity and definition brought to bear some very enjoyable moments. These earphones seemed to be tailor-made for brass, delivering exquisite low-slung swells that hummed with radiance. The closely mic’d acoustic guitars on Ray LaMontagne’s “Are We Really Through” seemed to positively bloom with woody warmth. And the AF78’s balanced armature carved out an impressive amount of clarity and body in the upper register, bringing out the high octaves of piano in tracks like “Philosophy” from Ben Folds Five with a depth that we’ve seldom heard so accessibly rendered. The AF78’s tendency to magnify detail also exposed some buried treasures we’ve missed in familiar recordings, like guitar clicks, inadvertent chair movements, and accentuated tape hiss, bringing a heightened degree of vibrancy and authenticity to the music. We even discovered a harmonic overtone in an acoustic guitar track from one of our own recordings that we’d missed in dozens of previous listening sessions. Our only real complaint came in the midrange, where we felt there could be a very slight absence of power and energy, perhaps offset by the earphone’s brilliant boldness in the treble region. The almost surgical clarity of the balanced armature seemed to rob just a bit of excitement from the upper midrange tones, lacking a bit of the shimmer we’re used to with a dynamic driver. However, the issue is a subjective one, and those listeners who are used to the clean swath of a balanced armature may find it a non-factor. The AF78 revealed moments of stunning beauty, showcasing depth, clarity, and richly-exposed timbre that places them well above the average in-ear. Though we had some minor issues with the midrange, overall we were very impressed by the breadth of detail and sumptuous tone the AF78 delivered. The fit was a bit uncomfortable for some of us, so, as always, we recommend trying them out for yourself before making any final decisions. Still, it’s been awhile since we’ve been treated to so many stellar moments by a single pair of in-ears. For the serious listener interested in digging deeper into their music catalog, we think the AF78 are well worth checking out.